Hoteliers want nothing more than to craft the perfect stay for each and every guest. But as an hotelier, there isn’t much you can do when you have an uninformed and difficult traveler. Mix in an Online Travel Agency booking and a sold out weekend, and you have the perfect storm. Sites like TripAdvisor allow travelers to read online reviews to determine which hotel to stay at and how that hotel compares to others in the area. With Facebook integration, you can see where friends and friends of friends have stayed, allowing you to have some context around the reviews. 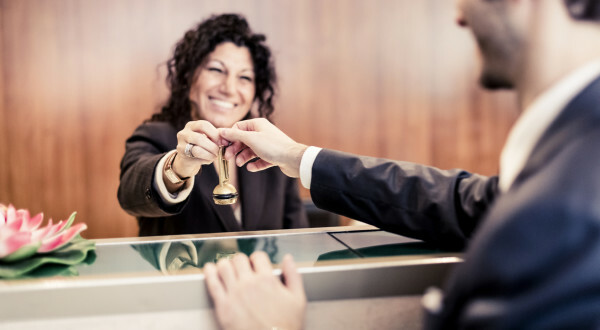 It can be a great help to hoteliers, in that a well-maintained TripAdvisor presence can help set the right expectations for prospective guests around what kind of stay to anticipate. Reading and analyzing reviews is also one way savvy hoteliers are improving their reputations. A wise guest will do research on these sites before booking to see what past guests are saying and which hotels are paying attention to feedback and responding to reviews. These hotels are likely guest-centric and will do everything in their power to exceed their guests’ expectations. Remember the last time you were figuring out which hotel to stay at and you booked through an OTA rather than directly through the hotel’s website? Unfortunately, you didn’t get the room type or view you were hoping for, and it ruined your impression of the hotel immediately. OTAs are taking a greater percentage of a hotel’s bookings as time goes by. And, with OTAs, guests don’t always get the experience they are expecting, because their preferences and personal details don’t always get shared with the hotels. Next time you’re looking to book, call the hotel directly and ask for the Front Desk/Reservations Office to ensure your preferences are met and the best rate is available. Instead of the two beds on the noisy street side, you may be in a corner King on the top floor. As far as what hoteliers can do to get guests to book directly, it’s always a good idea to ask all guests to share their contact information and preferences upon check-in. This way, you can follow up with a post-stay email or an offer to return at a special rate in six months, if the guest books directly with the hotel next time. With the explosion of social media, hotels are becoming savvier than ever in finding out who you are and where your interests lie. If hoteliers could capture that public information so they can customize your stay, what could be better? The resort you’re about to check in with could reach out to you prior to your stay to inform you of the private wine tour you’re invited to. And, this would be particularly great if they did this because the staff already knows you’re passionate about wine, based on your interests on Facebook? This level of customization is already possible, thanks to products like Revinate’s inGuest. When you tweet that you’re looking forward to spending your special anniversary at the hotel before your stay, you ensure the path to a good stay. Your name is no longer just another name on the reservation screen. The hotel now knows you will be sharing feedback about your holiday with your followers, so you are now a valuable promoter that will get preferential treatment. Many hotels will welcome you with an in-room amenity or a room upgrade, depending on your social media influence. We’ve all heard this phrase before, but it is very true in the hotel world. A common hotel misconception is, if you are firm and strong with your demands, then you will get your way. In reality, it is quite the opposite. Hoteliers are more than happy to assist in making your stay great, especially if you are kind to them. They work countless hours ensuring their hotel operates and functions well. Why not make someone’s day by being nice to him or her? Maybe he or she will repay the favor with a room upgrade. Plus, the hotel would love to have you fill out a post-stay survey with a glowing review of its team. Hoteliers often post these proudly in the back office, for all employees to see. Before joining Revinate, James Kaikis worked in hospitality for five years. He was formerly the Hotel Operations Manager with a specialty in VIP Services for a 1200+ room resort in Hawaii and an 800 room upscale luxury hotel in a major metropolitan area. Excellent article James. Congratulations and continued success. This is fantastic, James. We can tell then first hand what a wonderful job you did and continue to do.